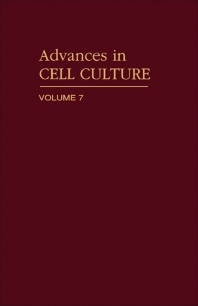 Advances in Cell Culture, Volume 7 is a compilation of research papers in the field of cell culture. The contributions reflect the applications of in vitro techniques of cell culture to biotechnology, reviewing the advantages and disadvantages of the methods. This volume covers the cultivation of fish and crustacean cells; gene transfer in insect cells; and the study of bacterial protein toxins using vertebrate cells. The fusion of plant protoplasts by electromanipulation; anther and microspore cultivation; gene transfer to induce morphogenesis; formation of phenolic compounds in cells and tissues in vitro; and new media and culture systems for the large-scale production of insect cells are discussed as well. Also included in the book is a biographical sketch of the 1986 Nobel Laureate Rita Levi-Montalcini, the developmental biologist who identified the nerve growth factor (NGF), a protein that is necessary for the growth, development, and maintenance of nerve cells in the peripheral nervous system and, apparently, also in the brain.